Forth issue and special issue of the eighth volume was published online in December, 2018. 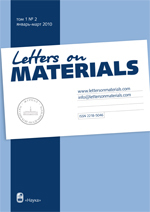 Third issue of the eighth volume was published online in August, 2018.
Letters on Materials launched integration with ORCID. ORCID provides a persistent identifier – an ORCID iD – that distinguishes you from other researchers and a mechanism for linking your research outputs and activities to your iD.